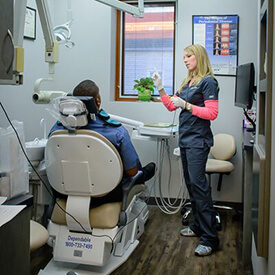 Attending comprehensive dental examinations and revitalizing cleanings here at Roselle Park Dental & Implants is the best way for patients of all ages to minimize their risk of oral damage and disease over time. If you’re ready to schedule an appointment with our dedicated doctors and staff members, please don’t hesitate to give our practice a call here in Roselle Park, NJ. Our team will capture digital X-rays so that we can view any decay, damage, cysts, or other concerns that are located under the surface of your smile. All of the tooth surfaces will be carefully checked for decay, cavities, and worn-down/damaged enamel. The gum tissue will be evaluated for any tell-tale indications of periodontal disease. An oral cancer screening will be performed to determine if any potentially cancerous cells are present and need attention. Any existing restorative work that you have (crowns, fillings, bridges, etc) will be reviewed to determine if they’re still functioning properly and providing adequate support to your smile. One of our talented hygienists will remove hardened tartar and plaque from the tooth surfaces, helping to prevent dangerous inflammation and the development of cavities over time. Minor staining will also be polished away when possible, leaving the entire mouth feeling nicely refreshed.